It is people like Nancy Kramis and her husband Ron who help make Beautify CNMI! what it is today. Nancy travels to work in the CNMI periodically to help our people learn to better assist and serve those citizens in our community who are deaf and/or hard of hearing. Depending on the need, Nancy stays for weeks, and sometimes several months at a time, and her husband Ron has made some of these trips out here with her several times. Their invaluable contributions as Beautify CNMI! community volunteers deserve to be recognized, so here begins the first posting of the Ron & Nancy Kramis Eco-cise series right here. After some begging, Nancy was kind enough to give me permission to post these photos and accompanying eco-cise journal that she shared with Beautify CNMI's Kaipat family (that would be my family and her adopted Island family). A couple of pics of Ron's and my Sunday a.m. eco-exercise program for your collection. Sunday, March 9 we did a round trip from the Bird Island lookout past entry to Kalabera to the end of the road. About 3 hours and not too much junk. Looked fairly good. We then hiked down to the beach and noted that the ocean has left way too many "presents" for us at the high tide line. So we high tailed it outta there with plans to return another day with many big bags. Gettin' outta there! STAY TUNED NEXT TIME FOR MORE. Nancy and Ron have contributed in so many other ways, from adopting a flame tree. . . L-R: Chuck Sayon of MINA; Nancy Kramis of Beautify CNMI Bellingham, Washington; Cinta Kaipat; and Doreen Jesus of Beautify CNMI Guam at the 2007 Flame Tree Arts Festival.
. . . to making a $500 donation at the 1st Anniversary Dinner for Beautify CNMI held at the Aqua Resort last year. They were there again this year at the Jake Shimabukuro Benefit Concert for Beautify CNMI and HANMI. In addition to their own Eco-cise, they've also participated in numerous Beautify CNMI! activities, including the monthly clean-up of the Paseo de Marianas, which is the heart of the Garapan Tourist District, and they've attended some Beautify CNMI General and Committee meetings. Ron is a member of Beautify CNMI! 's Parks & Trails Committee headed by Ken Kramer of RCD. Even when they're back in Bellingham, Washington, they still participate from afar in spreading the Beautify CNMI "beauty virus" in the mainland. Their dog, Molly Kramis, even planted a tree in honor of Arbor Day as we in the CNMI celebrated it here. Thanks, Nancy and Ron! Congratulations again on being winners of the 2007 Beautify CNMI! Spirit Award. You are quite an inspiration to many of us. Duty Free Shoppers has a new environmental campaign called 'Keen on Green.' There was an article about the campaign in today's Saipan Tribune. The Duty Free Shoppers Galleria on Saipan is joining its DFS partners worldwide in becoming “Keen on Green” for as long as the place is in business. Aldan-Pierce said the company has also formed a committee that meets via teleconference once a month to discuss progress on each division's “Keen on Green” initiatives. Aldan-Pierce explained that each division submitted a matrix on what type of recycling program is being done locally and what their plans are for future projects. “Ongoing programs may include simple and easy to do things like recycling paper by printing on both sides, recycling cans, newspapers, pallets, furniture, etc. ; reducing energy consumption by turning off lights when leaving offices or building; encouraging employees to bring or use ceramic cups for drinks to reduce or eliminate usage of paper and styrofoam cups; participating in community cleanups; and lots more,” Aldan-Pierce said. She said that DFS Saipan has a huge display of 100 ways to reduce one's carbon footprint and that each employee wrote his or her commitment on their own footprint. In observance of yesterday's Earth Day, 30 employees of DFS Saipan picked up trash from Smiling Cove down to the seaport following the pathway on both sides of the road. At the DFS corporate level, an Environment Strategic Task Force was formed to focus on reducing the use of energy at DFS worldwide. I have some pictures from their cleanup yesterday morning. I'll post them...soon. Scattered over eighty miles of the Florida Keys, the thirteen 1733 Spanish Plate Fleet wrecks present a unique opportunity for public interpretation of historic shipwrecks. During the summer of 2004 archaeologists from the Florida Bureau of Archaeological Research conducted a survey of these shipwrecks to determine their condition and their potential for inclusion in a proposed shipwreck trail. Presenter Jennifer McKinnon provides an overview of the project and the shipwreck trail. Jennifer McKinnon is a Lecturer of Maritime Archaeology at Flinders University in South Australia and was a senior underwater archaeologist for the Florida Bureau of Archaeological Research on the 1733 Spanish Galleon Trail. The waters around Saipan Tinian and Rota are littered with WWII artifacts, many of them easily accessible for divers and even snorkelers. Could we take steps similar to those in Florida in an effort to better preserve, protect and market what we have? Come, find out first hand from the expert and someone who’s done the work! Angelo O’Connor Villagomez is one of the co-founders of Beautify CNMI and the former Executive Director of MINA. He is an indigenous environmentalist and has been working on conservation issues in the CNMI for two years. Villagomez is currently the Saipan Coordinator for Ocean Legacy, a project of the Pew Environment Group. 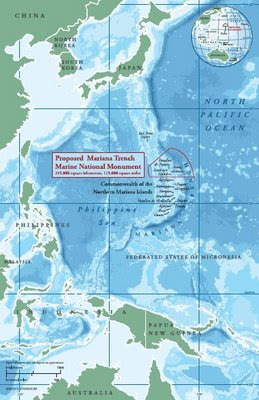 He is coordinating local support for a proposed “National Park of the Sea” encompassing a portion of the Mariana Trench and the islands of Ascuncion, Maug, and Uracas. His presentation will discuss certain unique aspects of the area and the benefits of a globally significant protected area. Currently a unique opportunity exists for the CNMI. Support for and against exists and people are weighing in on the proposal. Come and see for yourself what it’s all about. Ask questions and make yours an informed opinion! Marianas Dive is a growing group of individuals with a passion for everything underwater and specifically what Saipan Tinian & Rota have to offer as dive destinations. The group welcomes community members to join and help the CNMI build a truly world class dive destination while promoting our excellent diving locally and globally. Members meet the first and third Wednesdays of each month at 6:30 PM. 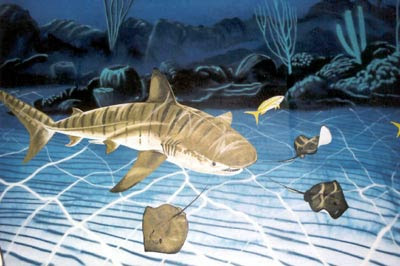 To join the email list, visit www.marianasdive.com. Sometimes things in the islands move a little slow. It took us a year to build it, but we finally have a trash trailer. A huge thank you to Bank of Guam and Shirley's Coffee Shop for donating the funds to build it. This year, PAWS and Beautify CNMI! will be celebrating National Pet Week from May 4th until May 10th. During this week, volunteers will be giving humane education presentations to various schools around the island and promoting the humane treatment of animals. If you are interested in learning more about our volunteer efforts, please contact Rose Callier at italiarose@hotmail.com. 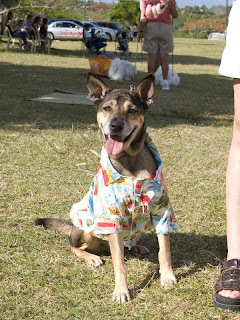 Participating in the event is free, though all participants must have on a collar and leash. And, if your dog has mange, we ask that you not bring the animal to the dog show. Rather, we urge you to take your pet to either one of the island's veterinarians for treatment. 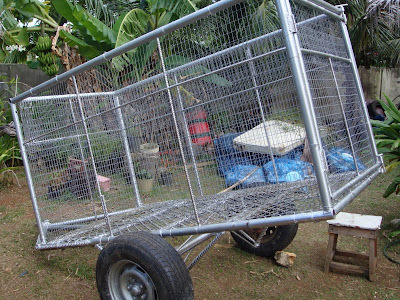 Entry forms and waivers can be downloaded at http://paws-saipan.org/. Please submit your entry form to Katie Busenkell at busenkell@gmail.com. The waiver must be signed at the event in the presence of one of our volunteers. If you have any questions, please do not hesitate to contact PAWS at busenkell@gmail.com or at 285-PAWS. PAWS and Beautify CNMI! would like to thank our 2008 National Pet Week Sponsors: Costco, PEW, Beautify CNMI!, DLNR, and Angil Design, Inc. Thank you for your generous donations and making this year's celebration possible! 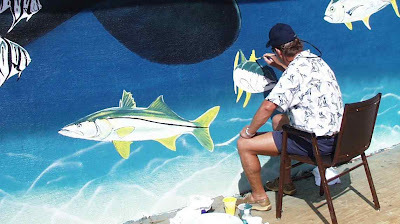 It has been reported here in the Variety that Wyland will be coming to Saipan to paint a one of his famous murals on the walls of CHC. It is unclear if this is a done deal or not as it will take about 60, 000 dollars to get him here. The effort is being spearheaded by MINA with the help of other island agencies including Marianas Dive which will host an information meeting tonight at 7PM, Chambre Bar in the Fiesta Hotel. Anyone interested in hearing more about this opportunity to bring additional press to the islands diving as well as something nice to look at for everyone including patients of the hospital are more than welcome to attend. Appetizers will be available and happy hour prices are in effect!